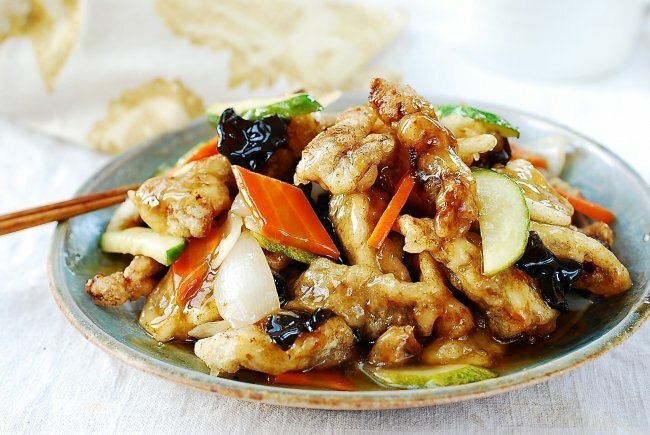 Tangsuyuk is a popular Korean-Chinese sweet and sour pork (or beef) dish! 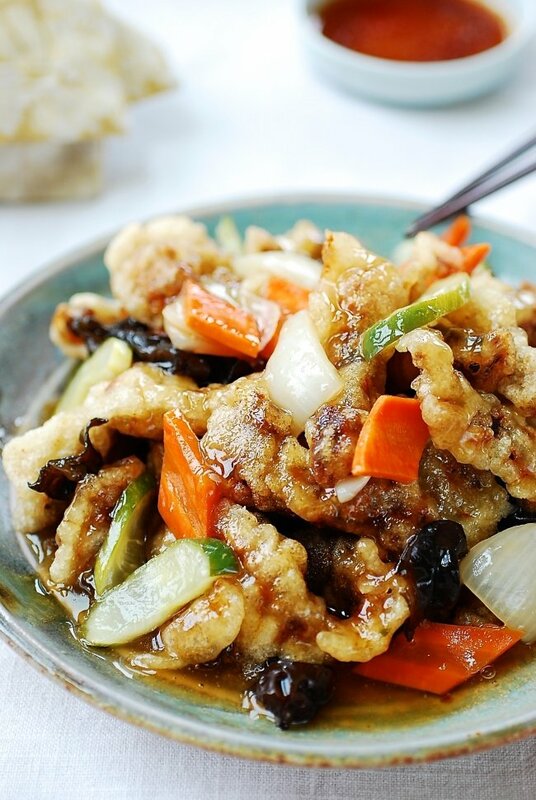 Learn how to make this crispy deep-fried meat in a delicious sweet and tangy sauce at home with this easy to follow recipe. 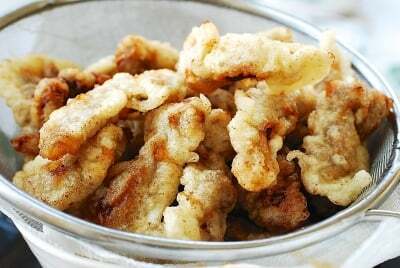 Tangsuyuk (탕수육) is crispy deep-fried pork (or beef) in a delightfully sweet and tangy sauce! It’s Chinese sweet and sour pork (or beef) dish adapted for Korean taste. Tangsuyuk (also spelled tangsooyuk) is another beloved Korean-Chinese dish along with the two noodle dishes – jajangmyeon and jjamppong. Every time my family goes out to a Korean-Chinese restaurant, we almost always order a large plate of tangsuyuk to share as an appetizer. At home, I often make this dish for special occasions or gatherings, especially when my extended family gets together. Everyone loves it! Tangsuyuk is easy to make, but the process goes very quickly. So, have all your kitchen equipment and ingredients ready before starting to cook. This tangsuyuk recipe was originally posted in September 2011. I’ve updated it here with new photos, more information, and an improved recipe. Growing up, my mother usually made this dish with pork. I usually do the same thing except when my sister-in-law who does not eat pork will be coming. You can use any meat of your choice for this recipe. 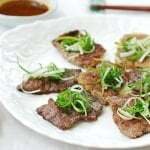 For a vegan tangsuyuk, try rehydrated dried shiitake mushrooms. They are meaty, chewy, and packed with earthy flavor. You’ll need to pre-soak the potato starch used to make the batter for about an hour or two. This is a traditional method used to create a slightly chewy yet crispy crust. 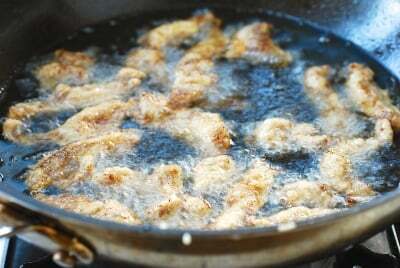 It is important to deep-fry the meat twice for extra crispiness. 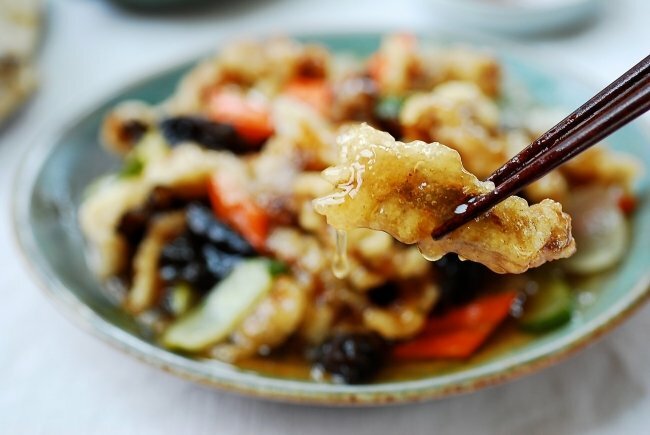 The key to a successful tangsuyuk sauce is the balance between the sweetness and sourness. This tangsuyuk recipe produces a well-balanced sauce, but you can always adjust to your taste. The vegetables add different textures and a colorful touch to the dish. In this updated recipe, I used carrot, onion, cucumbers, and wood ear mushrooms. Red and green peppers and green peas are also good options. You can also add some fruits, such as pineapple or apple slices. Some people like to have the sauce on the side and dip the meat in the sauce as they eat. I prefer the sauce poured over the meat. One of my readers once called the former a “dipper” and the latter a “pourer”. Which one are you? 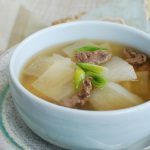 Have you tried this tangsuyuk recipe? Please rate the recipe below by either clicking the stars or leaving a comment! And make sure to share your creations by tagging me on Instagram! Stay in touch by following me on Pinterest, Twitter, Facebook, and Instagram. At least an hour before cooking this dish, combine 1 cup of the starch with 1 cup of water and refrigerate until ready to use. 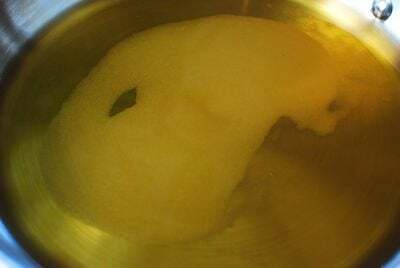 The starch and water will separate, and you will need to pour out the water on top to use the soaked starch at the bottom. 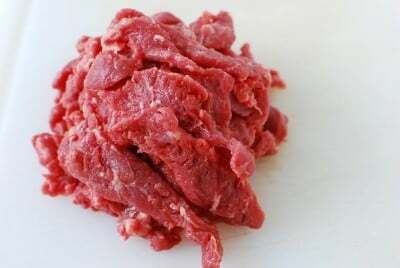 Cut the beef (or pork) into 2 to 2.5-inch long strips (about 3/4-inch wide and 1/8-inch thick). Lightly sprinkle with salt and pepper. Let it sit until ready to deep fry. 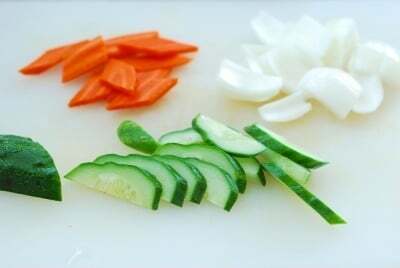 Prepare the vegetables by cutting into thin bite size pieces. In a pan, add 1 cup of water along with the remaining sauce ingredients except the starch slurry. Boil just until the sugar melts and turn off the heat. You will finish the sauce when the meat has been deep fried. Carefully pour out the soaking water from the starch. Use your hand to mix the soaked starch with the egg and oil. The starch will be very stiff. The addition of oil will help loosen it a little. Coat the meat with the starch batter. Add 4 cups of oil to a deep fryer, wok or large pot. Heat over high heat to 350°F. Using metal tongs or chopsticks, drop the meat in the oil one piece at a time. Do not crowd the oil. Cook until golden brown, about 3 minutes, in two or three batches, reheating the oil to 350°F between the batches. Remove them with a wire skimmer or a slotted spoon. Drain on a wire rack or in a large mesh strainer set on a bowl. Reheat the oil to 350°F. Add the meat (you can do this in one batch for the second frying) and deep fry again for 2 to 3 minute. Drain on a wire rack or in a large mesh strainer set on a bowl. Bring the sauce to a boil again. Add the carrot and onion pieces, which take longer to cook. When the sauce boils, add the starch slurry, stirring well. 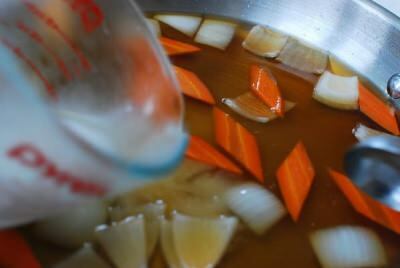 Taste the sauce and add a little more sugar or vinegar if desired. Turn the heat off, and then add the green pepper and pineapple pieces. The green vegetables, such as cucumber, lose their color quickly if boiled in the sauce. Place the meat on a large serving plate and pour the sauce on top or serve the sauce on the side. Serve immediately with a dipping sauce. Yummy! This looks wonderful. Have a great Labor Day weekend! I really do love this blog. 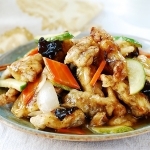 How interesting – we do have Japanese-Chinese sweet and sour pork too. LOL. Yours look MUCH closer to Chinese version and looks so delicious. My kids love this dish too and I should make your version one day. Thanks for sharing this recipe! This is a terrible site to go to, especially when the rest of your coworkers won’t hurry up and get their work done so we can go to lunch! thanks for another excellent recipe. I used to always order this with 짜짱면 so maybe I’ll make these two over the weekend! 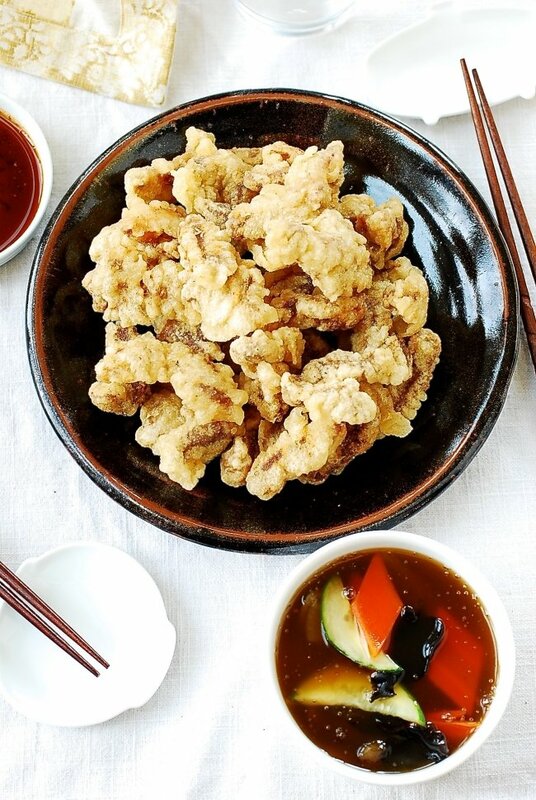 We love Korean-Chinese restaurants, and this one is one of our favorites, too! (Besides jajangmyeon and jambbong of course!) It’s going on my list! Bliss Bunny – Thanks for your kind words. You have a great labor day weekend too! Nami – That’s interesting! I didn’t know there was a Japanese version. I look forward to seeing it on your blog one day. Thanks! Hira – Apparently your coworkers need to have their priorities straight. Lunch first and then work! LOL. Hope you get to enjoy them over the weekend. Thanks for visiting and leaving comments! Andrea – It’s hard not to love them, isn’t it? Hope you had a great summer. Thanks for stopping by! Thank you, Sandra. You have a good weekend too. I will come over soon to see what you’re cooking. Mmmmmlicious, terrific and sumptuous stuff. I could have this for my meat lover dad. I miss good tansuyuk, thanks for the detailed recipe. I’ll have to give it a shot and then compare my results to the “real thing” when I get to visit Korea again in a couple weeks! 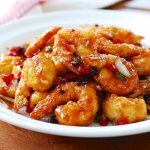 An excellent dish with sweet and tangy flavors! Hi Evan-ssi – Thank you so much! 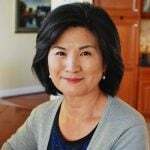 I am very happy to hear that you’ve been a big fan of my blog and liked my jeyuk bokkeum recipe. You have a lovely blog, which I am going to follow. Biren – Please try it. You will like it. Thanks for stopping by! are you making anything for chuseok? i thought of making songpyeon but i’m not sure where to get pine needles. do you just pluck them off a pine tree? lol. i wonder if its ok to steam the songpyeon without the pine needles? Evan – We used to do that when I was growing up – just plucked them off a pine tree. That was fun. But, it’s okay to steam songpyeon without pine needles. We have several places in the DC area we can buy good songpyeon from, but now I want to make some after talking to you about it. Ooh! 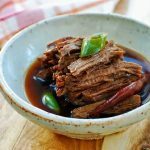 Your Tangsuyuk is so much more delicious than any restaurant’s… and now I can try making it myself! Thank you! Thank you, Soyeon! I know you can make this easily. I really enjoy your website. I will have to bookmark it and refer to it often. When I make my tansuyuk, I buy canned pineapples and use the juice in the can as part of the sauce. What do you think? Jimin – I do that sometimes too when I want to add a nice citrus flavor. Thank you for the nice words, and hope to see you here often. Enjoy! I made your tangsuyuk for dinner tonight. My family enjoyed it very much and there were no leftovers! I’ve tried to make this many times before with other recipes, but your recipe was the yummiest! Thanks again for posting and I love your blog. Hi Sophia – I am so happy to hear your family enjoyed it. Thanks for letting me know! Wow, I love love your website. 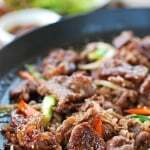 I’ve been looking for a good site for Korean food, but it’s been hit or miss. Everything looks wonderful. My husband is Korean and I’m not…so he doesn’t get to eat much of his native food…but now with your site, I will be sure to surprise him with all these dishes. Going to try this dish this week. Hi Hyosun, I tried your jabchae recipe and it was absolutely delicious. I wanted to try your tangsuyuk recipe but I was wondering- we have a deep fryer. Should I still fry twice? Thank you!!! So happy to hear that! Thanks for letting me know. You don’t have to if you prefer not to, but it will be crispier with double frying. Thanks for trying out my recipes. Enjoy! 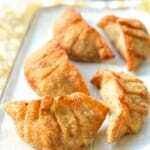 I love tangsooyuk but I cannot eat deep fried food. Can I bake the meat and dip in the sauce? Would it have the same taste? Is there a baked version? Thanks!! Love your site! hmmm I haven’t tried baking the meat for tangsuyuk. Try it! I am sure it will be different but it may still be good. Let me know how it turns out if you try. Thank you so much for the love! Thanks for sharing such an amazing blog post. Saw this at kdram Wok of Love..
Is there a way to adapt this recipe to avoid the deep frying; perhaps a baked version? I really want to make this, but can I leave the egg out or is there a substitute? My kids are very allergic to eggs. You can leave the egg out. Add more oil to loosen up the soaked starch. The texture and color will be different, but I’m sure it will still be delicious!